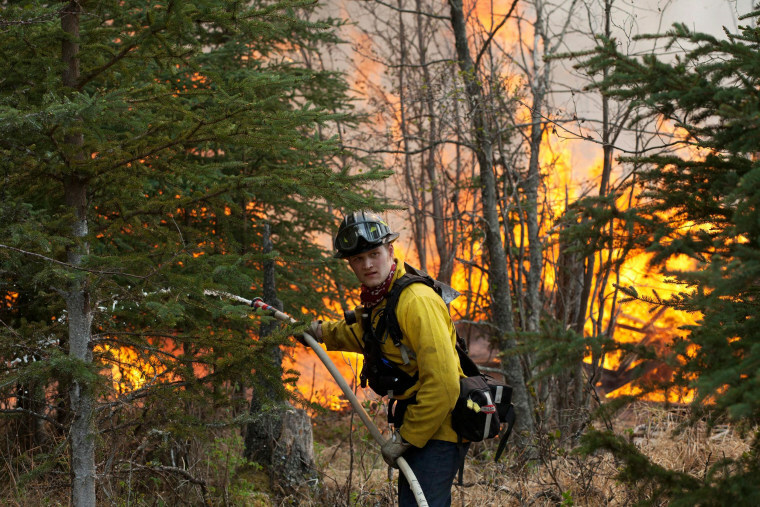 An evacuation advisory was lifted Monday for some residents near a 158,000-acre fire roaring through Alaska's Kenai Peninsula as firefighters who've labored for almost a week began to get a grip on the situation. Most of the Funny River Fire, which started a week ago, was burning inside Kenai National Wildlife Refuge. While it grew significantly overnight — from about 170 square miles to 250 square miles, larger than the city of Chicago — more than 600 firefighters made "excellent progress" extending containment lines west of the fire near the town of Kasilof, about 75 miles south of Anchorage, the U.S. Forest Service said Monday. The containment level had risen from 20 percent Sunday to 30 percent Monday, the agency said. An evacuation advisory was lifted for the Kasilof area Monday, but evacuation orders remained in place for areas along Funny River Road — a main transport route for firefighters — and the Keys area on the north side of the Kenai River. Incident managers said Monday that rain expected overnight into Tuesday morning —the first in almost a month — would help their crews significantly. Lydia Craycraft was among those who was forced to flee her home. "It was emotional. It was really hard, because you kind of have to give up everything you have here," Craycraft told NBC station KTUU of Anchorage. "But then that's not the important thing. As long as we get out and our pets get out, that's the important thing."